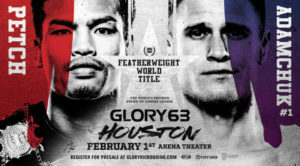 Glory Kickboxing has ventured into the Lone Star State for Glory 63 at Arena Theatre in Houston, Texas. The whole card is streamed on UFC Fight Pass. The nights feature attraction will see former champion Dutchman Serhii Adamchuk challenging Thailand’s Petchpanomrung Kiatmookao for the Glory Featherweight championship. The feature fight of the Super Fight Series is a top ten Middleweight bout, former champion, Dutchman Jason Wilnis vs. American Jacob Rodriguez.